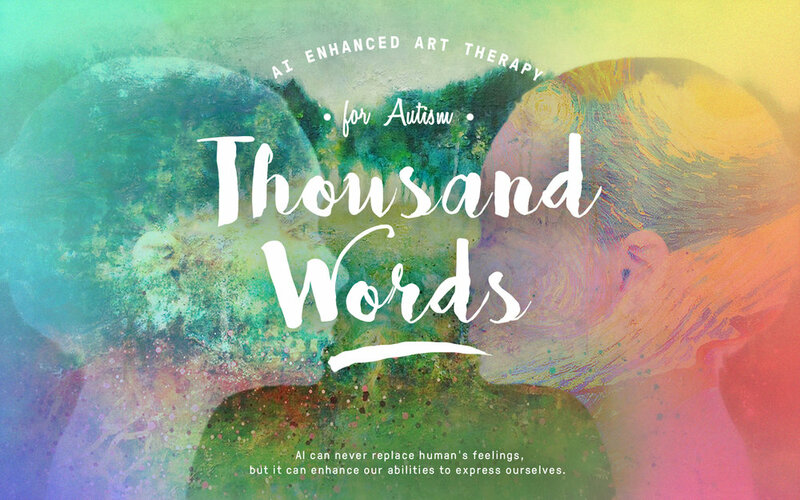 Thousand Words is a Virtual Reality application that helps Autism sufferers to explore and express themselves by crafting attractive artwork through Artificial Intelliengece. It also enables them to buid their social skills and better understand other's perspectives. 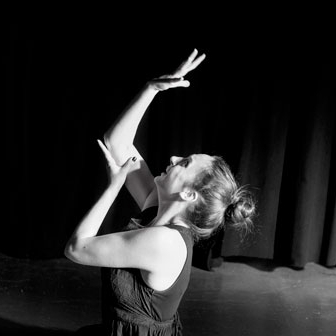 It's divided into two parts: artistic creation and artist-audience connection. Reports suggest that people with autism are often highly visual thinkers, and many report that they “think in pictures”. Expressing feelings and ideas through images is very natural for them and can be a relief from the daily struggle to express themselves verbally. Here, our app helps to translate the clients' random drawings into a beautiful artwork, which not only help them to feel better, but also encourage them to express themselves more. The user drawed a mountaion and creek. Artificial Intelligence enhanced it into a beautiful artpiece based on the style you chose. A calm environment that allows you to express yourself freely and paint your heart out! Autistic people tend to struggle with social issues, hard to comprehend other people’s perspectives and feel uncomfortable relating to others. Our app provides a gallery for them to show and appreciate other's artpieces. By looking at a peer’s art work offers a concrete way to “see” another person’s point of view and as the two share focus on the client’s art-making, a powerful bond can be forged without the initial need for direct, face-to-face interaction. 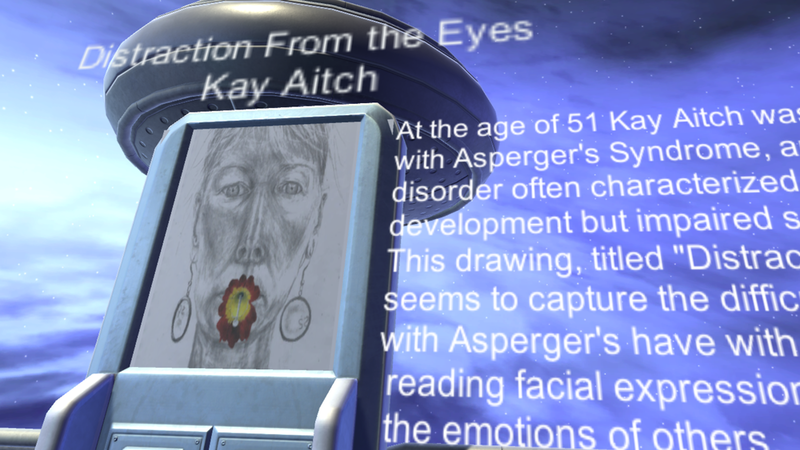 A novel art gallery where autistic artists' paintings can be enjoyed! In recent years, Autism has been featured frequently in the news. The symptoms of autism include impaired communication, social skills and repetitive behaviors. Caregivers are seeking complimentary treatments which have a broader range of options available. One such treatment is art therapy. Broadly speaking, art therapy promotes mental and emotional growth through art making. It is conducted with the aim of building life skills, addressing deficits and problem behaviors, and promoting healthy self-expression. No man is a lonely island. Expression is out-coming of your thoughts, your internal behavior at peak. Some times it gives us happiness , we cheers, we cry in sorrow, feel joy one of supreme feeling when we are in love, feel angry when aggression is there. Artificial Intelligence can never replace human's feelings, but it can enhance our abilities to express themselves. Despite getting inspired by and lauding famous people who were born with some form of autism, like Albert Einstein and Mozart, Autism is highly stigmatised in our society. The traditional methods of "Special Attention" only makes them feel isolated and lonely. Art Therapy is a good approach for people who feel hard to express themselves freely due to fear of being judged by others; also, the treatment sessions are more than they can afford. We used Unity engine to build the environments. 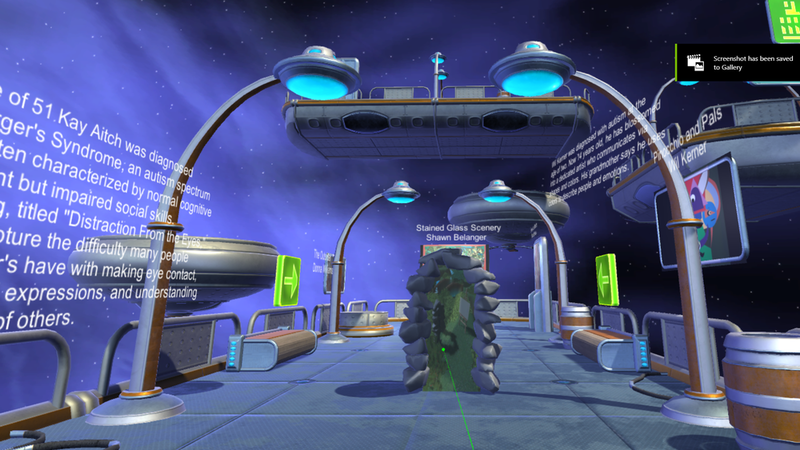 We used an open source GitHub repository and used a flask server to connect the VR app to the server. We performed art analysis based on the density of the colours and brush strokes used in the painting and mapped it to the emotions associated with it. 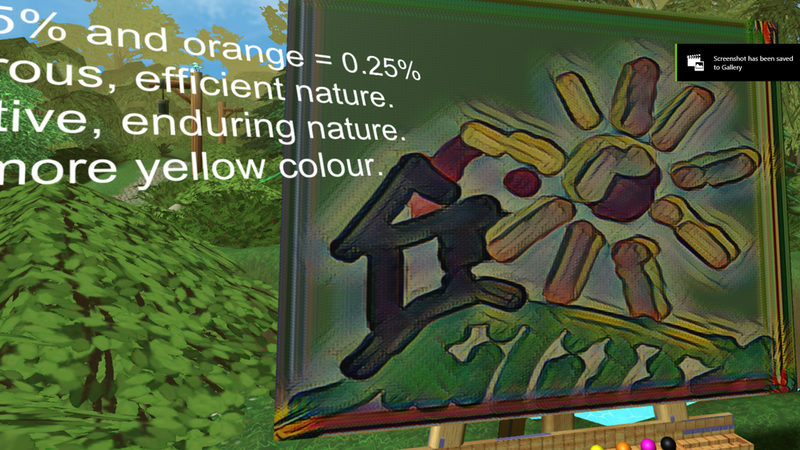 The painting done in the canvas is sent over the server to have the analysis performed and it returns a neural style version of the original image, which is equivalent to the therapist helping you with your art. It also suggests improvements that could be made to the painting based on the scientific studies done by arttherapyblog.com. Government and NGO could provide funding to schools, health care providers and hospitals, encouraging them to provide art therapy to Autism sufferers. Then the artpieces created by them could be sold to the public, or exhibitied at galleries and museums. The revenue generated could be donated back to government and NGO. Thus, a closed chain is created to promote the application of art therapy in medical care industry. In the future, we would like to implement better art analysis to help users get more professional feedback on their paintings. We would also like to include a scroll bar that allows the user to manage how much of his art he is willing to be modified. Also, we hope to make the analysis feedback faster to reduce the waiting time of the user and dynamically change the music frequencies based on the mood of the user.